Euthanasia may be the toughest decision you have to make as a pet owner, but at times it can be the kindest. One of the hardest things about owning a cat is that their average life expectancy is mid-teens, some longer and sadly some less. Our cats depend on us to provide them with comfort and maintain quality of life. Euthanasia may be the toughest decision you have to make as a pet owner, but at times it can be the kindest. You may have questions about what actually happens, or what symptoms you should be looking for, but have been uncomfortable bringing the subject up with your veterinarian. But we have all been in your shoes and want to help you through it, and know that the real difficulty is in knowing when to say goodbye to your cat. What are the factors to watch for? • Appetite – if your cat is eating, generally that is a good sign. But, is your cat eating enough to maintain weight? If your cat just takes a couple licks and walks away, it is not enough. If your cat will only eat treats, people food, drink milk/liquids, it is not enough. • Grooming – a healthy cat keeps their coat shiny and clean. If your cat’s coat is suddenly dull, flaky, or matted, they are no longer grooming or caring for themselves. • Activity – what is normal for your cat? An older cat likely will spend more time sleeping than when they were younger. If your cat still wants to be with you, enjoys being petted, maybe even plays on occasion, those are all good signs. The cat that is hiding and does not want to interact is not doing well. • Other symptoms – is your cat vomiting or having diarrhea daily? Are they no longer responding to medications? Are they suddenly not making it to the litter box or having accidents in the house? All of these are signs for concern that your cat is not doing well. This is the hardest question any of us ever face, and often the answer is not clear-cut. Some are personal decisions: if your cat has cancer, do you want to do every possible treatment – or not? While finances do play a role, that is not the only factor. How long would your cat survive, even with aggressive treatment? Does your cat have the temperament for treatment? Does your cat let you medicate at home? All of these factors enter into the decision. When your cat’s quality of life seems poor, when there are more bad days and bad moments then good, then euthanasia may be the most humane option for your cat. We do not take this decision lightly and having dealt with this in our own cats, we empathize with how difficult a decision this is. Most of our clients prefer to remain with their cat during the procedure, although this is up to each individual. After the cat has been examined, the doctor will give an anesthetic injection. You may hold your cat for this injection if you would like. After about 10 minutes, your cat will be in a deep sleep. After your cat is asleep and unaware of its surroundings, an intravenous injection is administered. This second injection will stop the heart and lungs. The doctor will check the heart and for final reflexes to insure your beloved pet has passed away peacefully. Most deceased patients are cremated; we have worked with a company for over a decade and we trust them to handle our patients respectfully. You may elect a private cremation with ashes returned in a sealed box; if not, the ashes remain at the facility. If you have a place to bury your cat, you may take your cat home (we will place your cat in a coffin/box). I’m really not handling this well, and my family/coworkers say “It’s just a cat”. 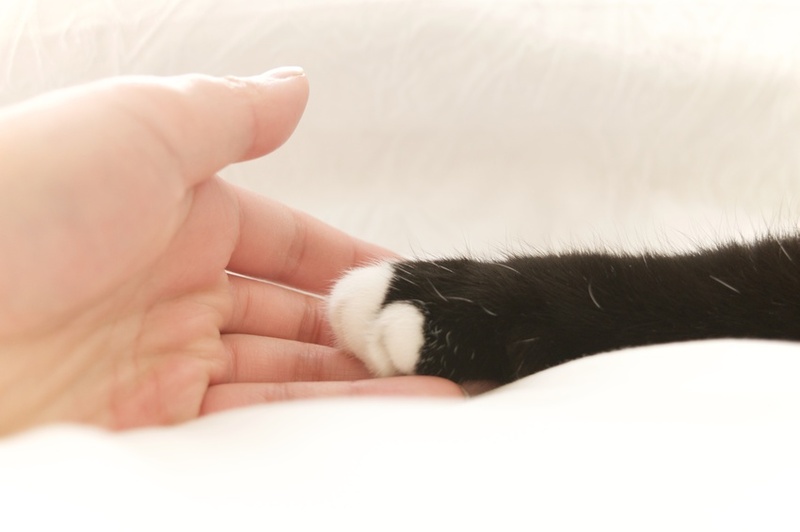 Please know that we very much sympathize with you – often your cat was special to our staff too. Our cats are among our best friends: they have shared major parts of our lives and losing them is really hard. If you have any lingering medical questions, don’t hesitate to ask us. Many people receive a lot of support from their family, friend and social media friends (ie Facebook). Also, there are grief hotlines for added assistance. The Montgomery County Humane Society has a pet bereavement support group that meets the first Saturday of every month. Check out their website for more details. Additionally, we have a list of psychologists and social workers locally who work professionally in grief counseling (and are pet-owners themselves). Time does heal, but sometimes talking to someone can really make a difference. I had just lost my first cat and when I walked into the clinic one day and the staff said “Here is your new cat”. She had been abandoned in a trailer park, scrounging what she could find to eat, but she was a beautifully fluffy, grey cat. I didn’t feel ready for a new cat, but she obviously needed a home. Minnie became a wonderful companion and integral part of our family. The relationship is different – each cat is unique – but they all enrich our lives.